I bought this weekend a pager for 2 euros and decided to plug my scope on it to see what could I find out. The case mentions 147.250MHz, and "RTT/SMF/X205", unfortunately this didn't help much! 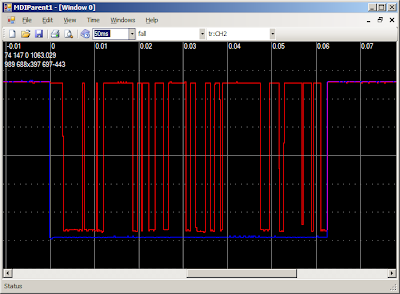 I plug my scope on the digital output of the receiver and I noticed a burst of serial data every 1 second exactly. BTW the blue channel is hooked to a pin that goes low every time there is serial data coming in the red channel. Thanks everyone for reading, any info is welcome! funny! Did you get it at Elak? I just picked one up there as well, not sure why really, just thought it looked nice to hack or at least steal the buzzer from! I'll play with it soon and let you know what I find out, but I don't think I'll dig into the frequency... thought mine has some company name written on it, maybe we could just find out what gear they used, find it again and make our own secret paging network! hey, yes I did buy it at Elak so it is probably the same one, it has written on it RAMACOM. BTW Do you know other shops here in Brussels besides Elak? no, I don't know any other shops. I just moved here. Hi the first CRO shot indicates the battery saver is still on. make our own secret paging network! We built some in building paging systems using VHF twoway radios and PC's with simple interface and software. Would you be so kind as to send me a digital recording of the signal? Decoding it would be a nice little challenge for a dull flight or trainride. No news unfortunately, but i still remember about this once in a while... It's can't be so difficult to crack the messages! I'll be happy to follow you if you have a blog where you plan to track your progress! It's a shame this didn't take off it was sounding very interesting.